Spring has officially arrived, and with it, the anticipation of long hikes, weekend camping trips, and more time communing with nature. Of course, nature also encompasses wildlife, some of which – bears, mountain lions, or even a seemingly docile bison – can turn an outdoor adventure into a trip to the hospital (or worse). And though animal attacks on humans are extremely rare, spring, when animals are coming out of hibernation and caring for their young, presents a good time for a primer on what to do if you cross paths with a potentially dangerous animal. For expert insight, I spoke to Kurt Johnson, the resident naturalist at Spring Creek Ranch in Jackson, Wyoming, who's also a wildlife photographer with decades of experience in the wilderness. "What’s really interesting about wildlife interactions with people is that they’re communicating with us constantly," Johnson says. "They’re telling us when they become uncomfortable, when they get agitated." A good rule of thumb with any animal, Johnson says, is to understand that if "what you’re doing is changing the behavior of the animal, you’re doing something wrong." Here, more tips on understanding animal instinct and staying safe in the wild. Bears: Johnson offers a few basic tips when it comes to bears. First, hike in groups, since “statistically, your odds of getting attacked by a grizzly or a black bear go down to almost zero if you’re hiking with three or more people.” Second, if you’re in bear country (National Parks will provide alerts of sightings) bring a canister of bear spray and know how to use it (spray blasts up to 30 feet and can immobilize a bear for days). Also, sing or shout as you hike to alert bears to your presence and avoid surprising them. Confrontation strategies differ for grizzly and black bears, which are the most aggressive types. But how to know the difference? It’s not easy, but grizzly bears have longer claws, a more concave face, and a distinct shoulder hump (test your skills with an online quiz by the Wyoming Game & Wildlife Commission). The distinction is important, because with a charging grizzly, you should play dead, since the animal’s intent is usually “to take you out of the equation,” Johnson says. Cover your head and neck and tuck into a ball, using your backpack for protection if possible, and give the animal plenty of time to leave. If it’s a charging black bear, however, most experts advise standing your ground. Make yourself as big and intimidating as possible – yell, shout, raise your arms and open your jacket – to try to scare off the bear. And resist the urge to run or climb a tree: Bears are fast runners and good climbers. Mountain Lions: These big cats are common in California and Montana, and attacks on humans, while very rare, have been increasing (and gaining more press) in recent years. Mountain lions hunt alone and stalk their prey, so hiking in groups and making noise along the trail are good preventive measures. If an attack occurs, Johnson advises the same strategies as with a black bear: Do not run or turn your back, make yourself as big and intimidating as possible and prepare for a fight. Sand in the eyes, rocks, or hiking sticks can be used as weapons. An early warning sign they're getting agitated? They turn around and face the other direction, showing their rear end, which also helps explain why wildlife photographers tend to have a “huge collection of rear end photography,” Johnson notes. Both animals will charge if they feel cornered (just check out this video of a man getting charged by a bison that's been shown at some visitor centers in Yellowstone National Park), especially if it’s a female with her young. Give them plenty of distance – the National Park Service requires a minimum of 25 yards for all wildlife (100 yards for bears and wolves) – and take cover in a vehicle or up a tree if they do charge. Wolves: Forget about movies like the recently released The Grey, starring Liam Neeson, about a pack of wolves ravenous for human flesh. Wolves (the photo at right is actually of coyotes) may look (and sound) fierce, but attacks on humans are incredibly rare. “If I’m hiking and see a wolf in the wild, the last thing that comes into my mind is danger,” Johnson says. 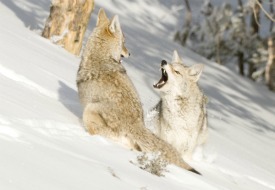 “I feel awe and appreciation, but fear doesn’t even register.” That said, Johnson noted that pets can sometimes be targets, so it’s a good idea to keep an eye on Fido when camping or hiking in wolf territory. Snakes: For all those folks who have an overwhelming fear of these slithery critters (like yours truly), Johnson offers a comforting tidbit: “Almost all snake bite injuries are in men ages 16-25, on their forearm. So in other words, that tells us that most of these snake bites are in young guys who are trying to mess with the snake.” In other words, leave them the hell alone. See our Wyoming destination guide for more trip-planning information, then use our Travel Search price comparison tool to find the lowest rates on flights.